الخيار الأفضل للحصول على المتعة والاسترخاء، Grand Hotel Melbourne يقع في منطقة رائجة من أفضل مناطق المدينة. يقع مركز المدينة المثير على بعد 0.2 km فقط. يوفر العقار بفضل موقعة الجيد وصولاً سهلاً إلى أهم معالم المدينة.
. إن الخدمات الممتازة وحسن الضيافة العالي في Grand Hotel Melbourne تجعل إقامتك تجربة لا تنسى. لضمان راحة ضيوفه، يقدم الفندق الخدمات التالية: مكتب الاستقبال على مدار الساعة, مرافق مخصصة لذوي الاحتياجات الخاصة, تخزين الأمتعة, واي فاي في المناطق العامة, خدمة صف السيارات . استمتع بوسائل الراحة الراقية في الغرف أثناء إقامتك هنا. بعض الغرف تتضمن بياضات, مرآة, مناشف, مكيف هواء, تدفئة لمساعدتك على استعادة طاقتك بعد يوم طويل. يقدم الفندق مجموعة واسعة من وسائل الراحة المتنوعة، كمثل: حوض استحمام ساخن, مركز للياقة البدنية, ساونا, حمام سباحة داخلي, سبا. إن Grand Hotel Melbourne هو خيارك لخدمة الفنادق الراقية في المدينة. - Free breakfast daily during the guests stay. - Breakfast is in RAB restaurant and Lounge Bar and consist of: 2 beverages and one food item (hot or cold) per person, from the a la carte breakfast menu. - Breakfast is for either for 1 or 2 guest, as booked to stay. I booked the executive studio apartment. The apartment had a little kitchen sitting area and a bedroom upstairs. The room was quiet and the staff were very helpful. The location was excellent right next to Southern cross station. Loved the atmosphere of the old railway building. No noise despite being very close to train line. Room large with small kitchen. Clean, staff friendly. Would definately stay again if I wanted to visit casino, Docklands, Etihad Stadium etc. is probably due for refurbish soon as rooms getting a little tired. After reading all the publicity about this 4 star establishment, made a booking on the easter Sunday (very cheap rate). Was very disappointed in the quality of the decor and the noise that was heard from the railways. On a positive note, the bed was of excellent quality, but not a king as advertised. Been there done that, don't think I'll be returning. Love this building! Have seen others complaining about hearing the trains - our room looked down onto the tracks and station and we could not hear any of it with the window closed. Don't let it turn you away. The only down side was that the spa was cold and not working properly. Loved our stay at The Grand. Extremely quiet with soft comfortable bed. Our apartment was on two levels. Loved the soaring ceiling and large bathroom. Excellent facilities including heated pool, spa, sauna and gym. You can even have a barbecue in the courtyard if you are staying a few days.Excellent breakfast and lovely cosy library with gas log fire. Staff are very friendly too. Will definately return. So relaxing and an easy free tram ride into the city or a quick walk to Docklands or Southbank. Ticks all of the boxes. Loved the grand architecture too and the history of this amazing building. this hotel is just next door to the train station, which is the drop off point for skybus from the airport. so from getting off the bus, walking to the hotel took us a quick 5 minutes. the spencer street tram stop & the bridge crossing yarra river are also right in front of the hotel, so location is absolutely perfect. the vintage looking exterior & interior is great. and everything is clean, well maintained. check in was quick and easy, reception staff was friendly & helpful. the kids loved our duplex (2-storey) room. very spacious, high ceiling, complete with fully furnished pantry. and they enjoyed the indoor swimming pool & jacuzzi. Overall very happy with this hotel. It was obviously once an extremely opulent and premium hotel. It manages to maintain this feel despite it being a little aged. The loft style room was certainly spacious, the bed was extremely comfortable. The location puts you at an easy walking distance to everything Melbourne has to offer. The staff were also very friendly and helpful. No complaints from me; I;'d certainly recommend this hotel. Nice accommodation considering the price. We were surprised at the the high-ceiling hall and room, and fell in love with the room. The lobby is also very nice with carefully prepared book shelf and decorations. The only weak points are parking fee, wifi service, and views from the window. Anyway, I would choose it again if I go to Melbourne. Large rooms and comfortable beds. Have stayed at other hotels in Melbourne. This is the first time for the Grand and won't be my last. Loverly rooms with that older style and very good beds. Small in room kitchen was very handy and even had a dishwasher. 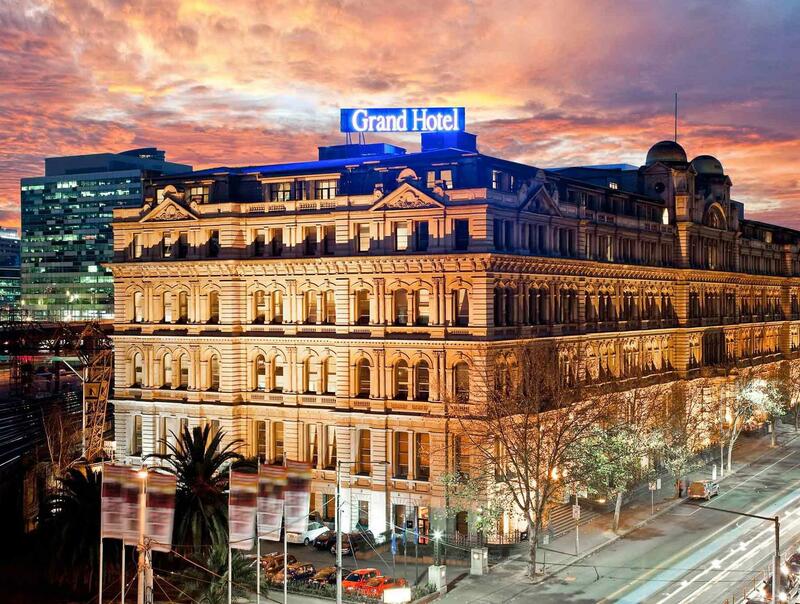 We were very impressed and will be going back to the grand next time in Melbourne. Also it is a very short walk to casino. Recommended. we were truly pleased in our stay and we highly reccommend this hotel. a must stay if you will go to melbourne. just in front of southern cross railway station and also very close to the city circle free tram station that takes you around the cbd. it's really a great value for money and staff are very hospitable and nice. what we liked the most is the unique and distinct feeling that makes u feel that u travel back in time cz of the beautiful and classic elegance and style of the hotel..
Great hotel, my favourite in Melbourne! Great location, great staff, rooms always clean and comfortable, staff always ready to help. And I’m always amazed by the beautiful hallway!! Fantastic hotel. Generous rooms, lovely pool, sauna and spa. Breakfast from restaurant was wonderful. Rooms were quiet and clean. Yes, it is dated but the charm distracts from this. The DVD player didn’t work, which didn’t really matter but discovered too late to be fixed. My daughter and I stayed for our shop until you drop trip and it was a great location. We are big Downton Abbey/period drama fans and the staircase was amazing. We will be back next year. Lovely old hotel. Beautiful big windows in the room. Comfy bed and cosy feeling room with the right ammenities. Rooms service is reasonable priced however need to be updated as what we ordered was more expensive when we went to check out, and staff didn't follow up. Coffee cups were dirty too but otherwise all fine. Just back from Europe and somehow this glorious building reminded me of that and also the lovely grandeur of Melbourne... lovely high ceilings and location, location, location - great food, such a beautiful comfy bed and pillows! I've read some reviews that say it's a 'bit tired'. Who cares! It's just lovely! Pros: 1. Excellent location. In CBD, close to tram station, crown casino, DFO Mall (for shopping), Eateries, South Cross Station (5 mins. walk) 2. Comfortable and big room in loft style with excellent kitchenette and other amenities. 3. Toileteries - They use Appelles poducts which are definitely luxurious. 4. Courteous and helpful staff specially Marie Anne and Jag at the front desk. And even the housekeeping staff. 5. Heated swimming pool wih jacuzzi and sauna - open till 10:00 pm. Came in handy after a long day on the roads. 6. Best of all - Staying in a historic and grand building. Cons: There were hardly any except they have two elevators only, one at either side of a long walk. So a bit of wait for the elevator. But I think its part of the charm. such a gorgeous historical building. Actually reminded me a little of the Warldorf in NYC! Staff are ever so friendly and the rooms are clean and very modern. I love the old architecture and the huge windows! Great views of the railway and Docklands. Very quiet too, considering the trains are riding past throughout the day. The building itself made me feel privileged to spend the night there, such an amazing architecture. The room I stayed was a suite and had everything I needed, very spacious and clean. The staff was friendly and efficient. The location was perfect, 10-15 minutes from the convention centre and less so to Collins Street. If just the weather had been better, the whole experience would have been great!